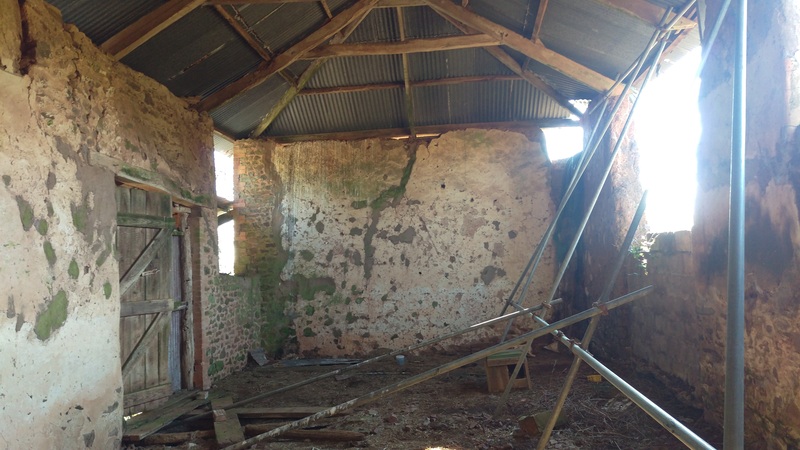 In May 2016 we commenced work on a cob barn conversion. 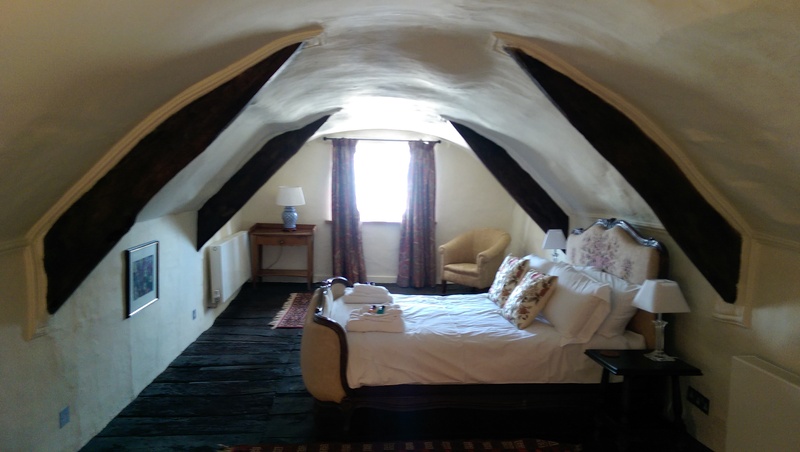 The old threshing barn is located rurally, in the heart of Devon’s countryside. When we began work the building was derelict. 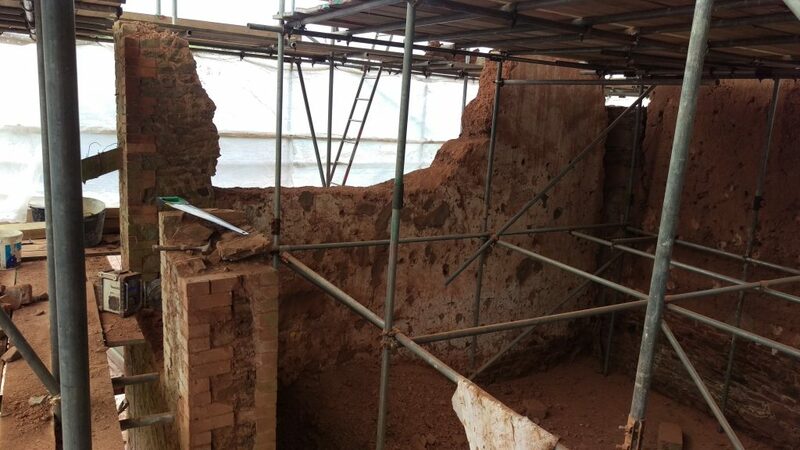 The tin roof was failing, thereby allowing water to seep into the cob walls, causing more damage with each soaking; if our customer had not rescued the barn, it would have slowly deteriorated until it crumbled completely. So commenced the project to convert the barn into a traditional living space with a modern twist. The plans allowed for a three bedroom barn conversion of the main barn with a modern extension and an attached thatched linhay. The end result will encompass a mixture of old and new, combining traditional materials such as cob, and specialist lime rendering techniques. The use of glass and metal will create a modern contemporary feel with careful consideration to the surrounding environment. With a project such as this one there are many elements involved. We work closely with the customer, architect, and various subcontractors on each part of the project. The first job was to remove the superfluous tin roof. This in itself an easy job; the repair to the damage its inefficacy had caused, more demanding! 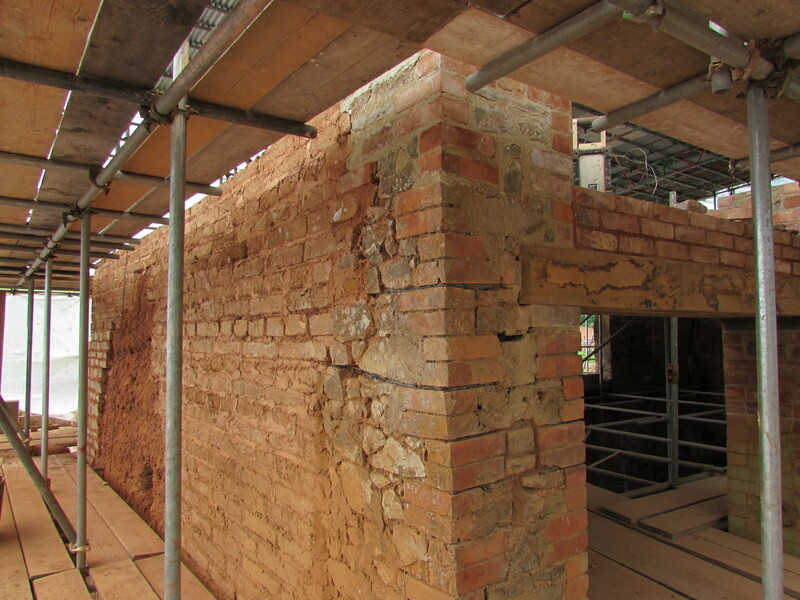 The cob walls required extensive repairs. 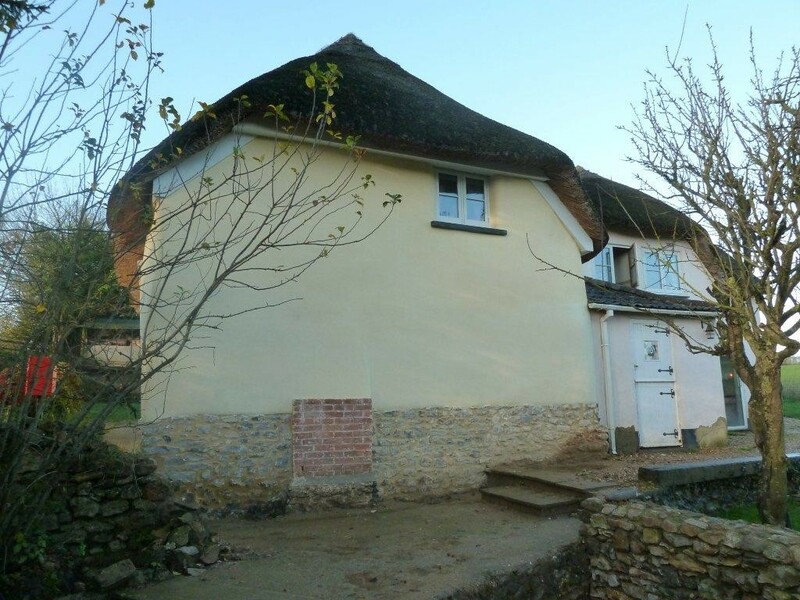 We commenced work on the south facing wall and worked our way clockwise around the building, removing any inadequate cob and replacing and rebuilding with cob blocks and earth mortar. Overall the work took around six months to complete. 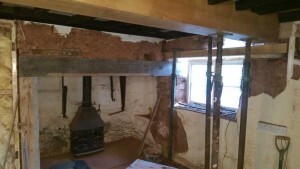 After we completed the main barn’s cob walls, the oak wall plate was fitted. 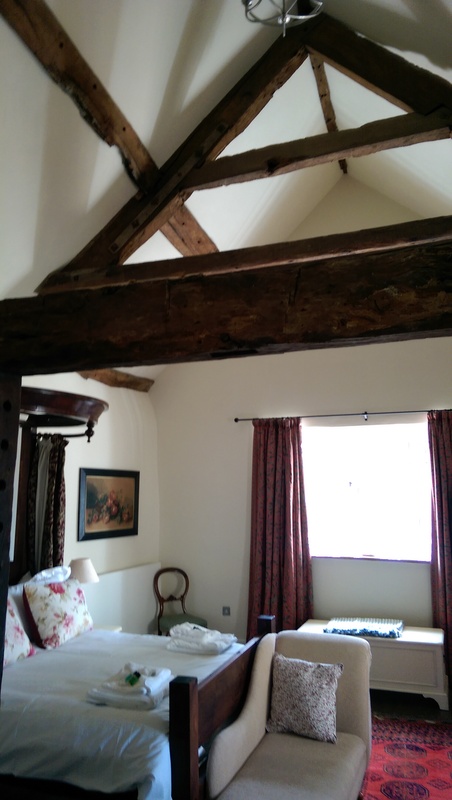 Four oak trusses, hips and purlins then soft wood rafters were put in place, with the insulation installed between. 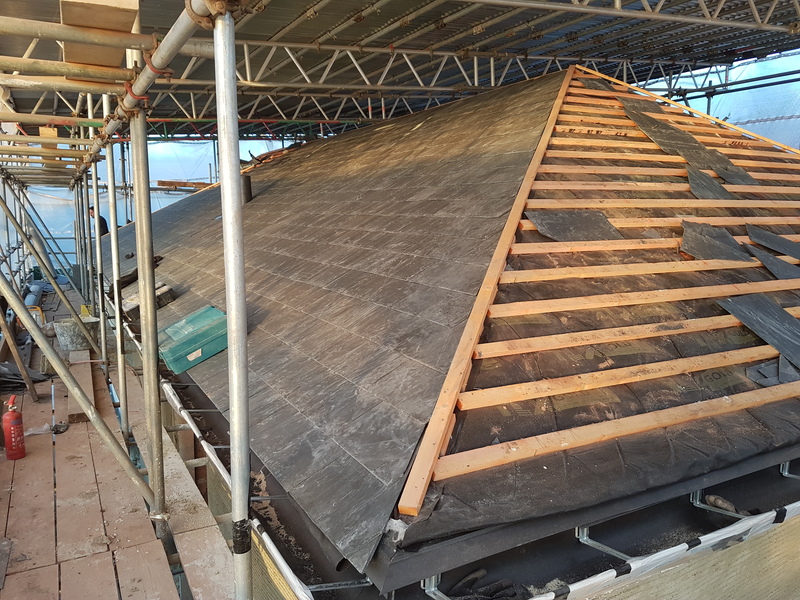 The insulated felt was overlaid and battens made ready for the first slates to be laid. 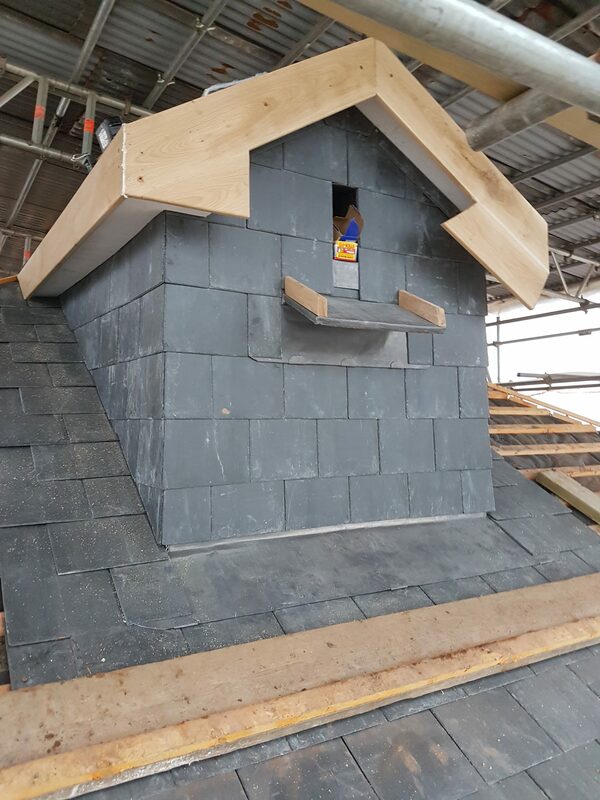 The slate used for this project was a natural slate called Glendyne. 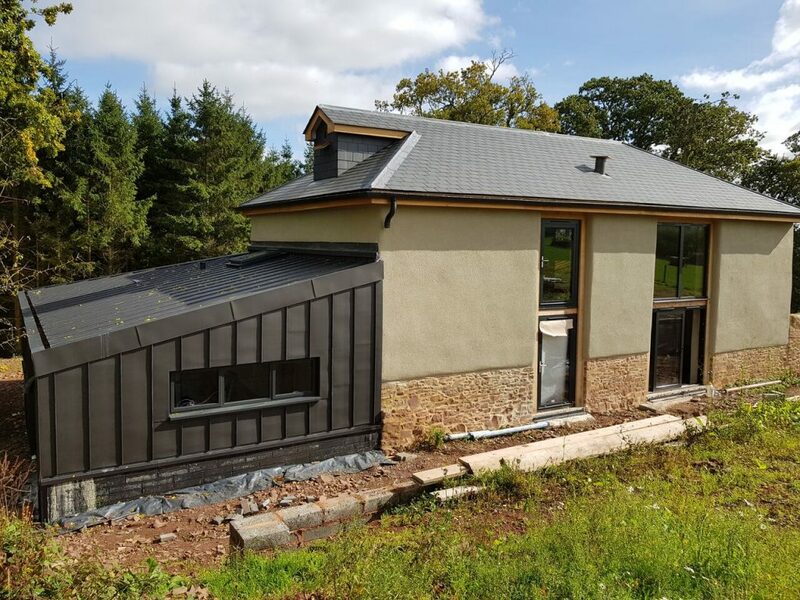 We used a local company, Kilbride Roofing Ltd, for this element of the project. 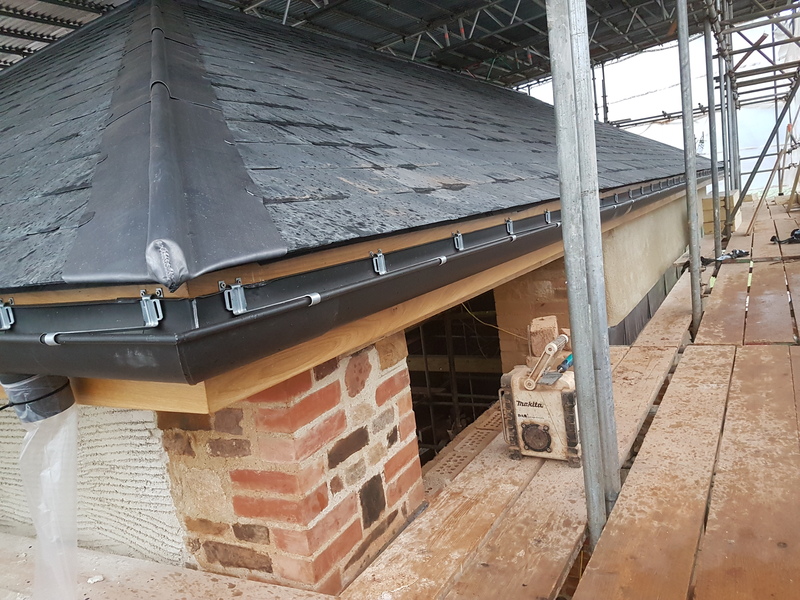 Following the completion of the slate roof, the soffits, fascias, guttering and downpipe details were added. 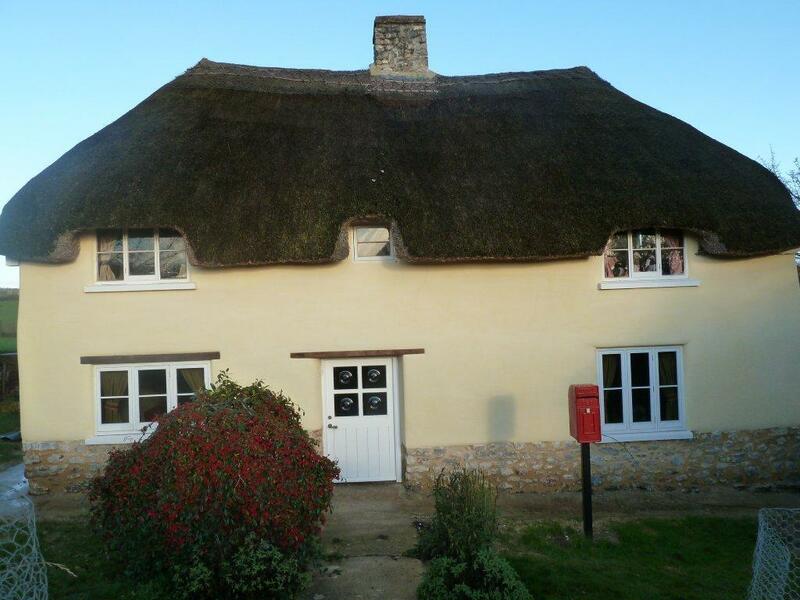 Whilst there was activity on the roof, Earthouse was busy rendering the exterior with a traditional lime render. 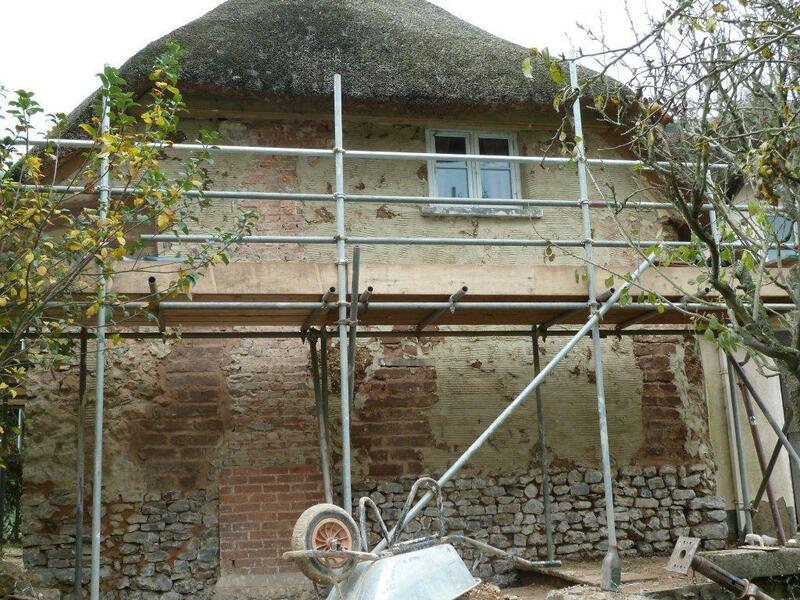 Lime render allows cob to breathe, allowing moisture to travel in and out of the cob without damaging it. 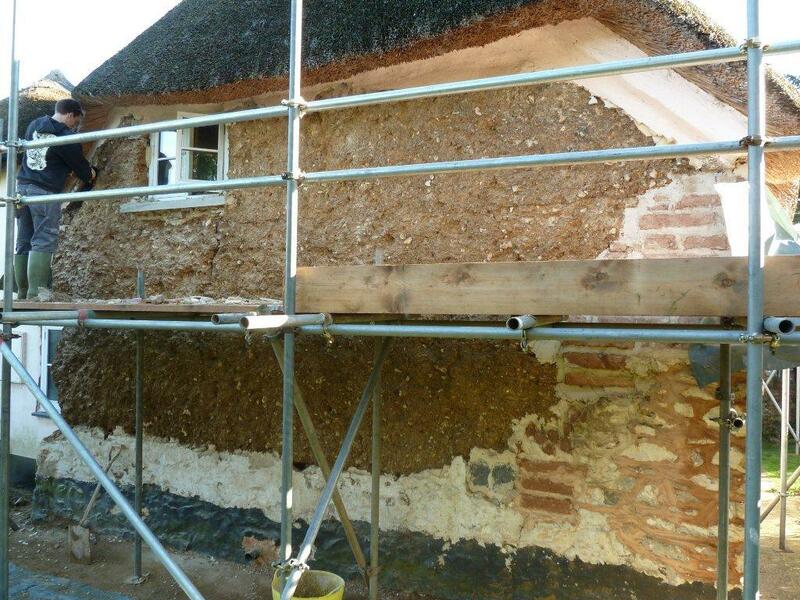 An insulated lime render was used for the first three coats. The main barn has two windows of note. Both are floor to roof, a height of 4.5 metres each. 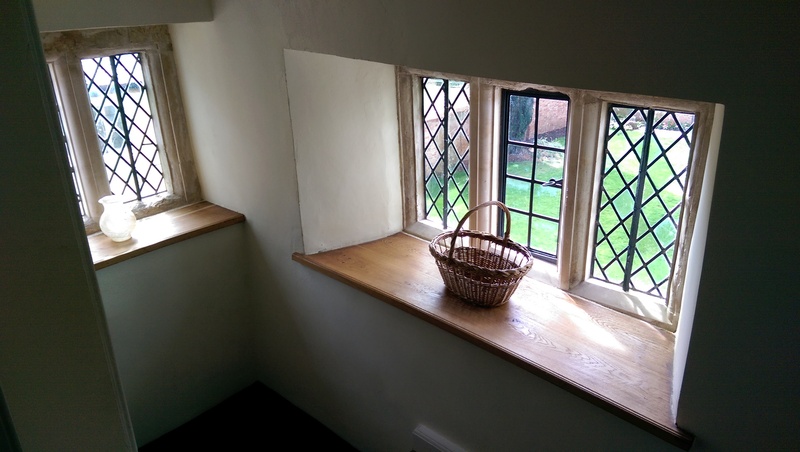 The window frame is made from Douglas pine, sandwiched between 80mm of oak either side. Aluminium windows will be fitted. Next was the excavation of the interior floors. Then came the laying of insulation (glapor) and the installation of underfloor heating pipe. 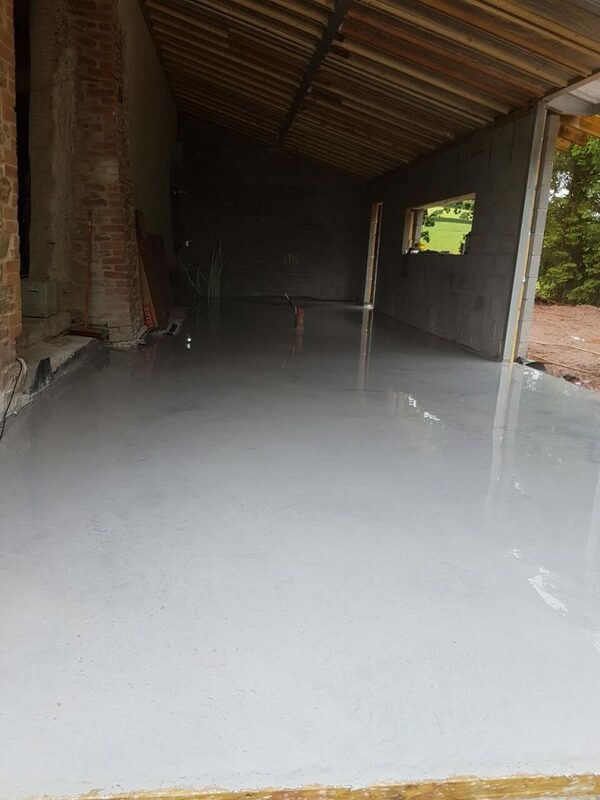 The main barn has a cut back pumice limecrete screed, not dissimilar to polished concrete, but with different shades of grey and white tones and a matt finish giving a more subtle look. 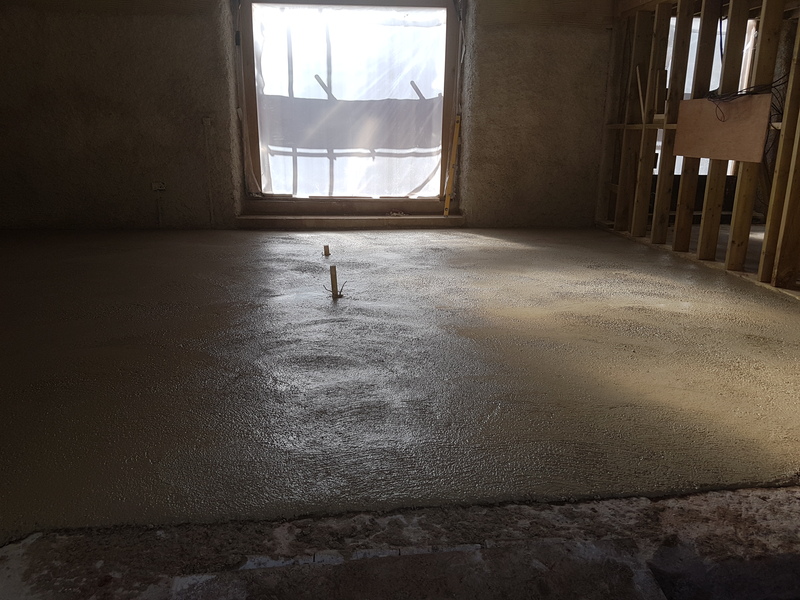 The floor in the extension is a polished concrete, which has a beautiful shine when sealed and is more in keeping with the modern element of this part of the building. 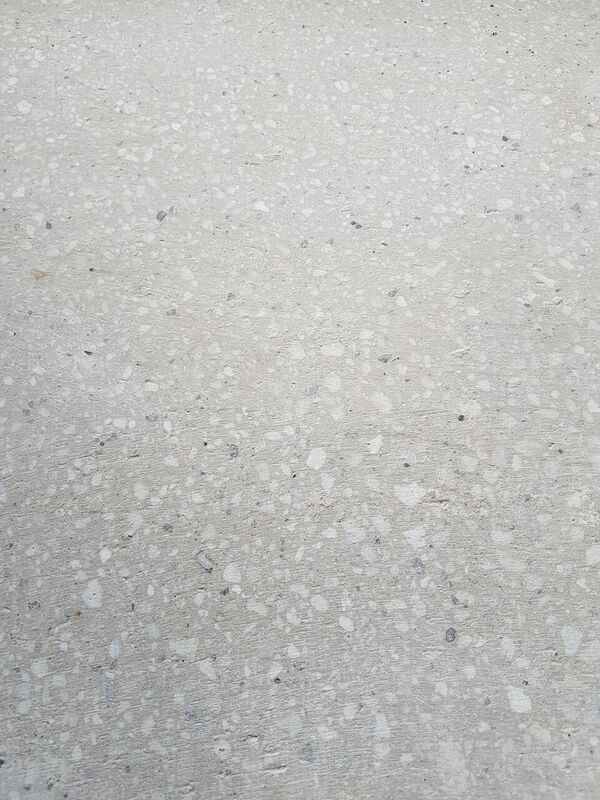 Again, the concrete is warmed by underfloor heating. The extension itself is a single storey lean-to attached to the north and east elevations of the main barn. 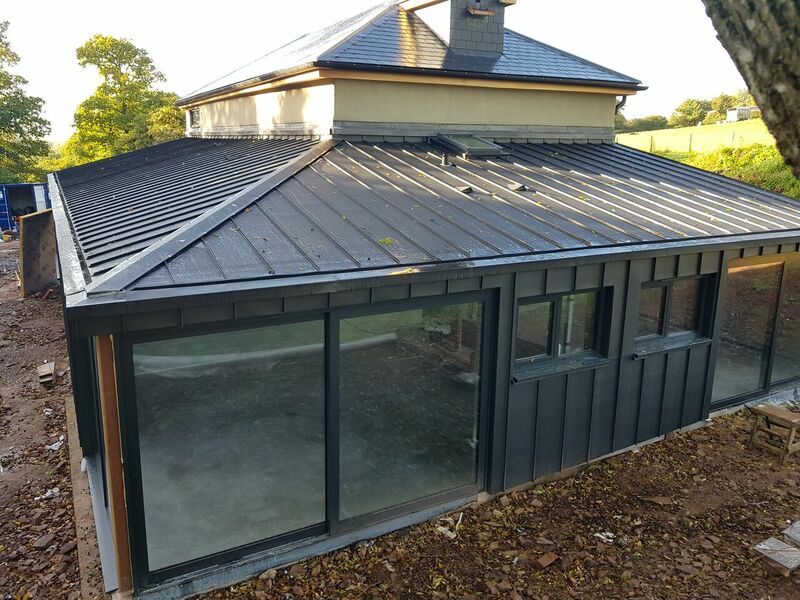 The external walls and roof are ultra-modern dark grey crimped zinc. We are seeing so many buildings using crimped zinc now. 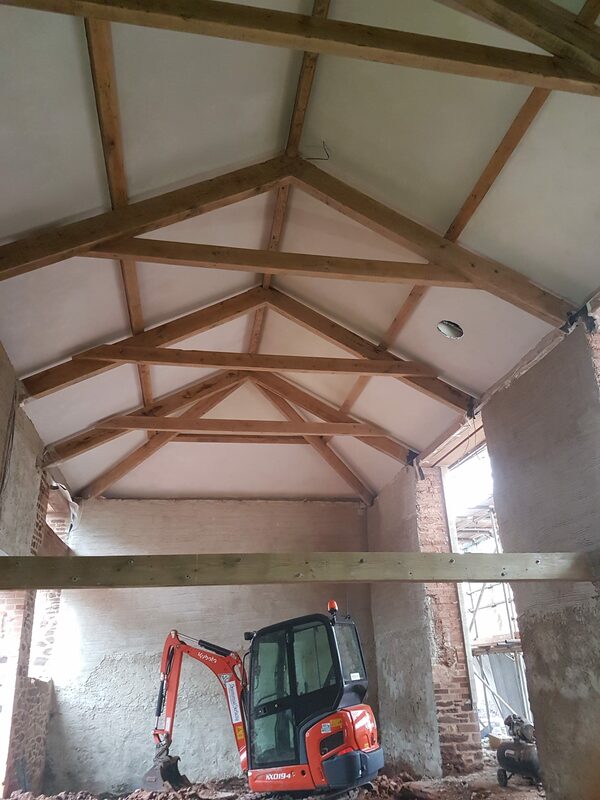 The extension spans two walls of the main barn conversion. 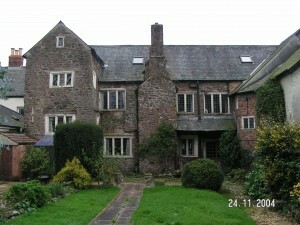 It is 50% glass, comprising both doors and windows supplied by Aspect Windows Ltd in Exeter. The photo below shows the far end of the barn conversion, with the extension; these rooms are ensuite bedrooms. The interior of the barn on completion is large and light. 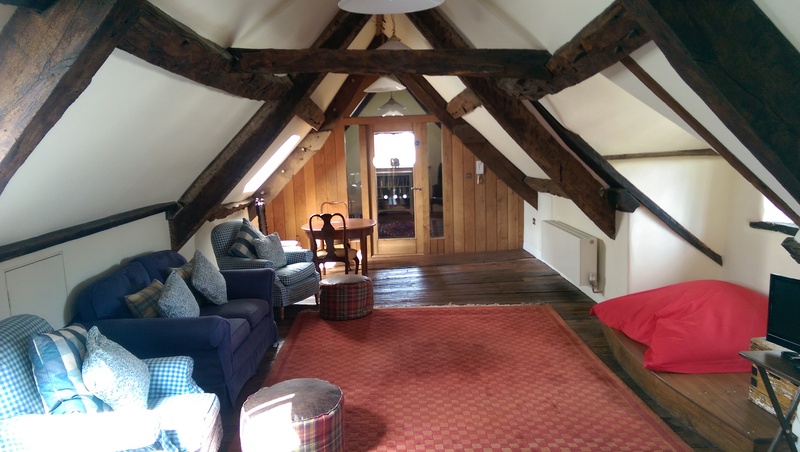 The main living space is vaulted double height, overlooked by a timber mezzanine floor. Upon the mezzanine is the office. 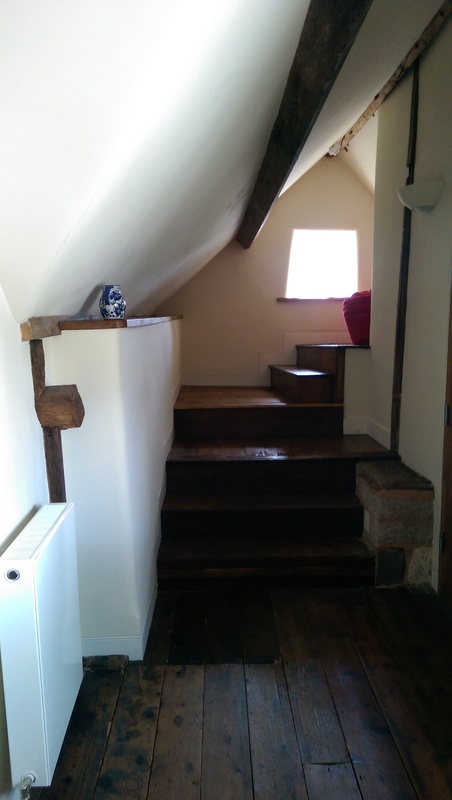 Below the mezzanine floor lays a hallway leading to bedroom 3 and the staircase leading up to the floor above. 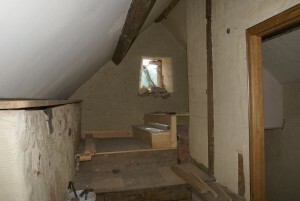 There is also a passageway leading to the ensuite bedrooms 1 and 2 in the extension. Upon completion, the mezzanine wall and timber was painted with Farrow & Ball paint in many different shades of grey. The majority of the lighting is from a fantastic shop in Exeter, Amos Lighting, which we highly recommend. 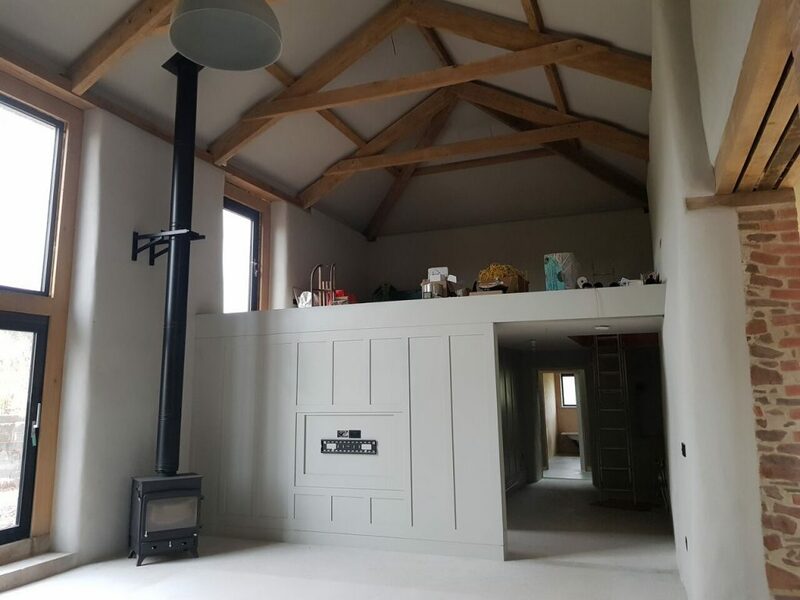 The woodburner and flue was supplied and installed by Woodwarm near Cullompton, who offer a wide range of contemporary and highly economic woodburners. No project is ever without its own unique set of complications and whilst at Earthouse we are lucky to work in some beautifully remote locations and we regularly see fantastic wildlife, our barn owl invasion was by far the most spectacular. The young owlets were snuggled up in the wall which was in the worst state and without attention this wall could crumble, crushing the birds. Barn Owls are a protected species which we were well aware of and we sought immediate advice from The Barn Owl Trust. In order not to disturb the creatures we stopped work until the Barn Owl Trust had visited site and specified where and what we could continue. A temporary owl box was erected closely in the vicinity of their original nest and they quickly took to this, the droppings making their use of it evident. Many people would be disgruntled by owls stopping work on their site and to a degree it was frustrating. 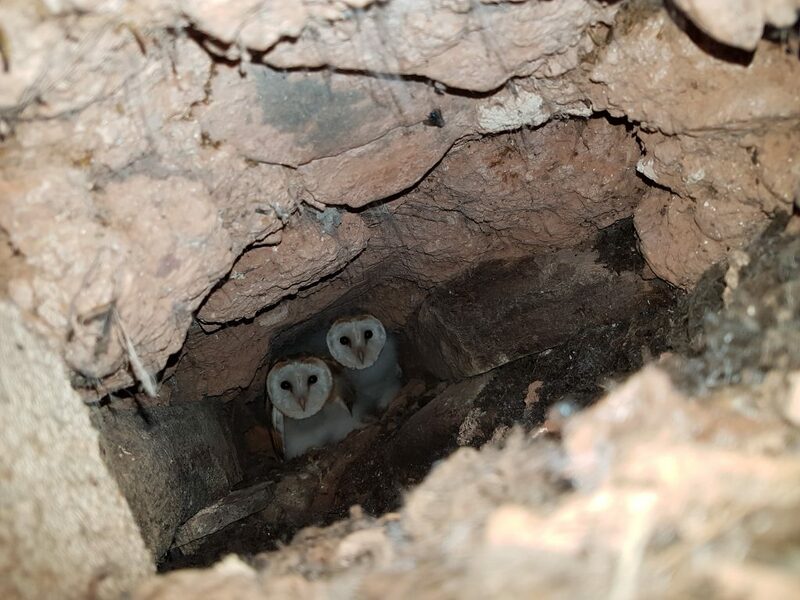 However, the owls enchanted us and the owner, who now has a fantastic extension of a large owl box which the owls began using almost immediately, obviously not concerned by the continuing building works going on around them. Before and after – a drastic restoration project! 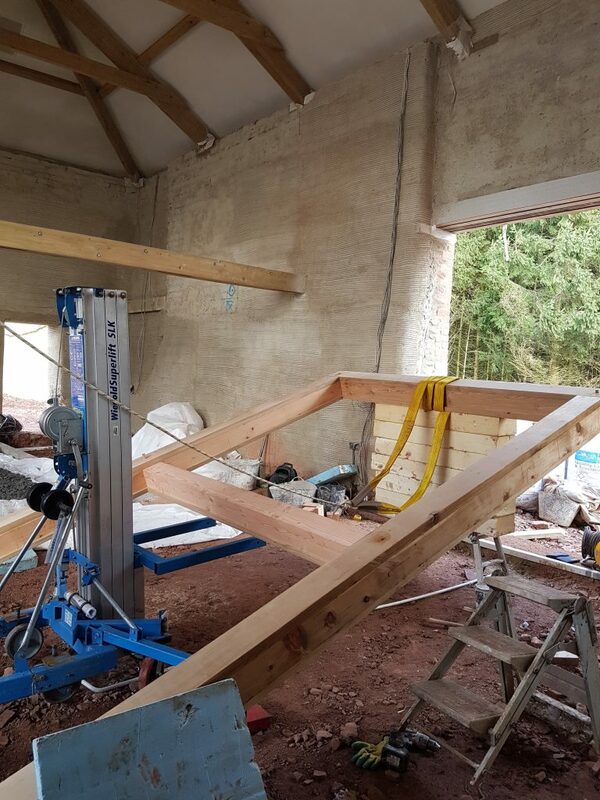 The final parts of the project are always vital; the construction is obviously key, but these are the bits that the customer living in their home will see. 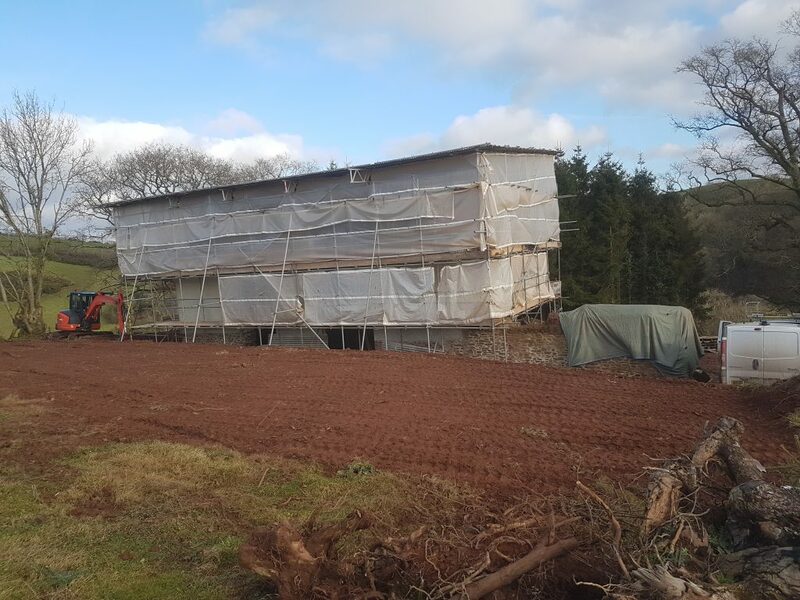 As I write, the site is once again a building site as work commences on The Linhay, so I don’t have the beautiful landscaped photographs of the finished barn quite yet. 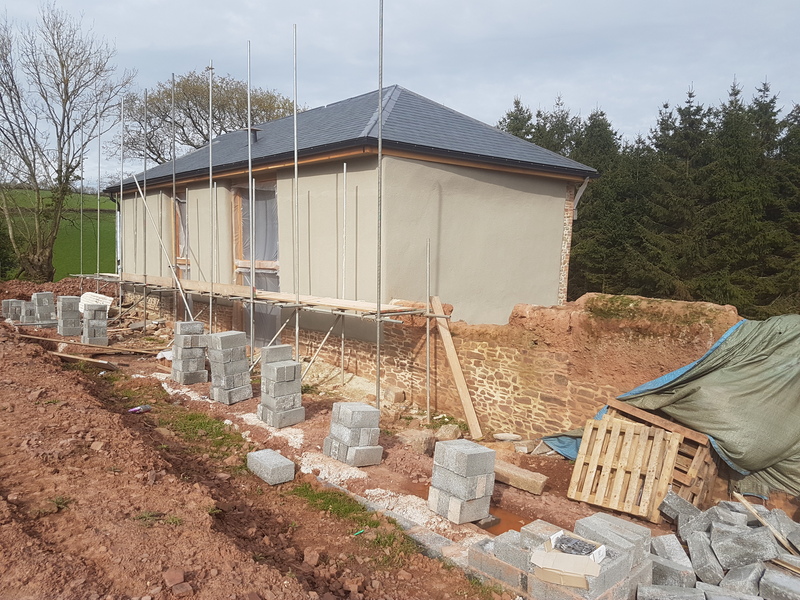 Below you can see the stark contrast of the barn when we first started working on it, and the newly lime rendered conversion and extension in the wonderful Devon sunshine. The owners spent Christmas in their beautiful barn conversion and we hope to have more interior and exterior photos to show you very soon. 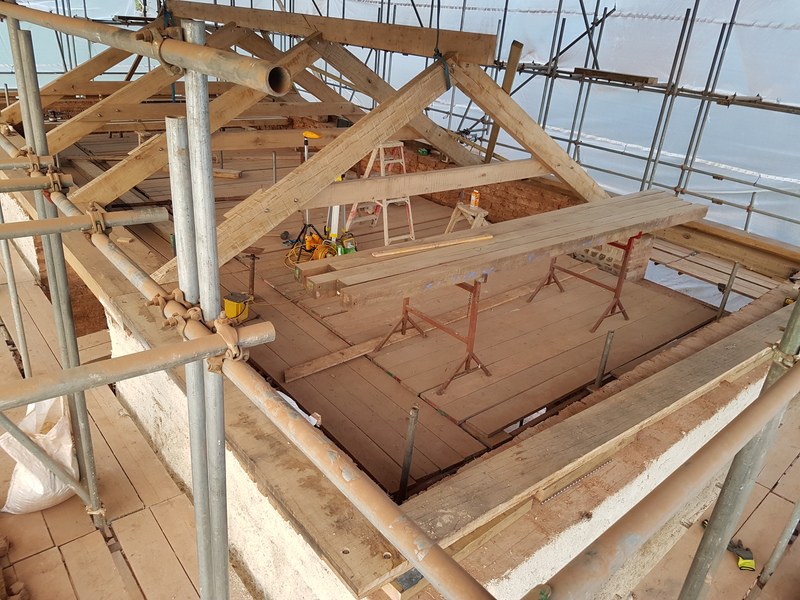 If you would like to know more about the work we do, or to discuss your barn conversion project, please feel free to contact us. 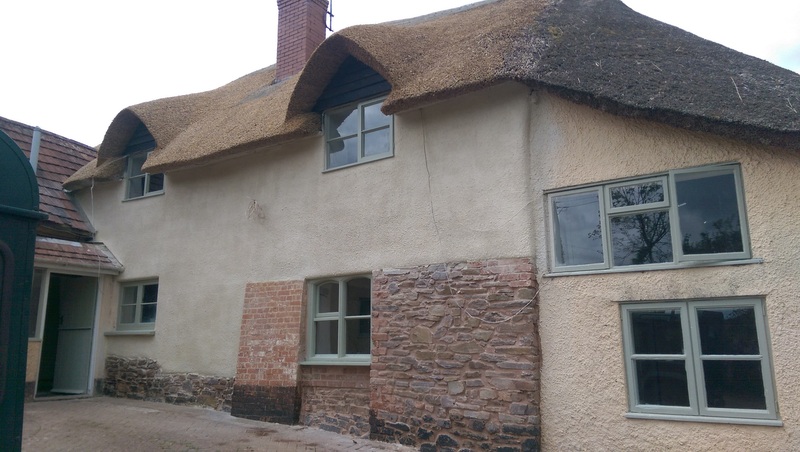 Earthouse Building Conservation Ltd has been fortunate enough to be involved in a diverse mixture of projects over the last twelve years and we wanted to share a few of these with you. Our work takes us to private residential properties, commercial properties and even ecclesiastical buildings. We work closely with insurance companies and the local councils, particularly the Planning and Conservation Officers. If you are not sure where to start with a project we can often point you in the direction of the right person. 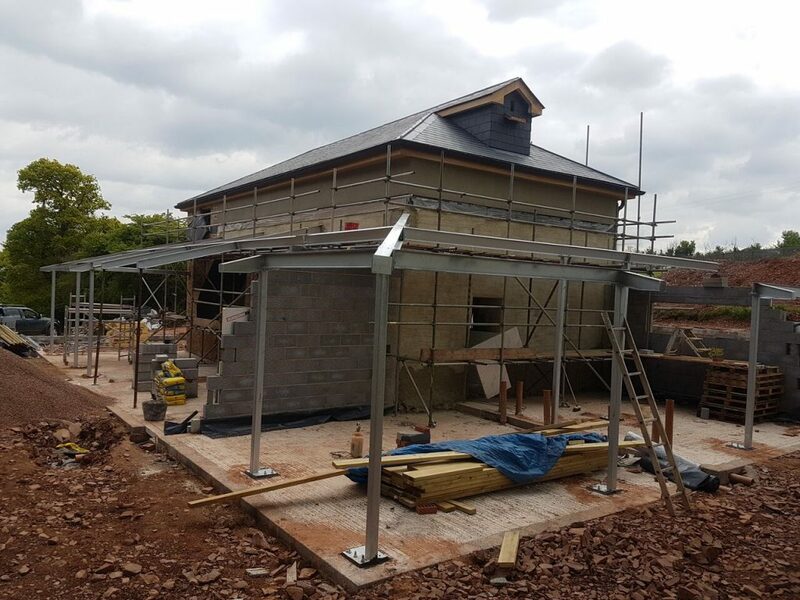 We project manage our own sites and we have also worked on sites managed by other contractors, most notably The Walronds. We also work on sites where customers want to manage their own property and we are able to assist them with this. Please have a look at some of the properties we have restored. The work was different at all of them , some needed more work than others. 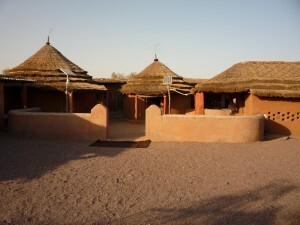 Primarily these buildings were cob or stone constructions, rendered in lime. 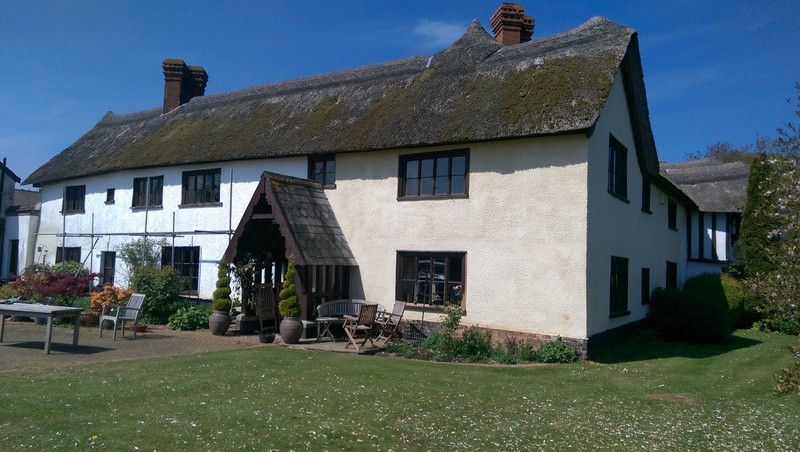 Medieval court farm, near Cullompton. 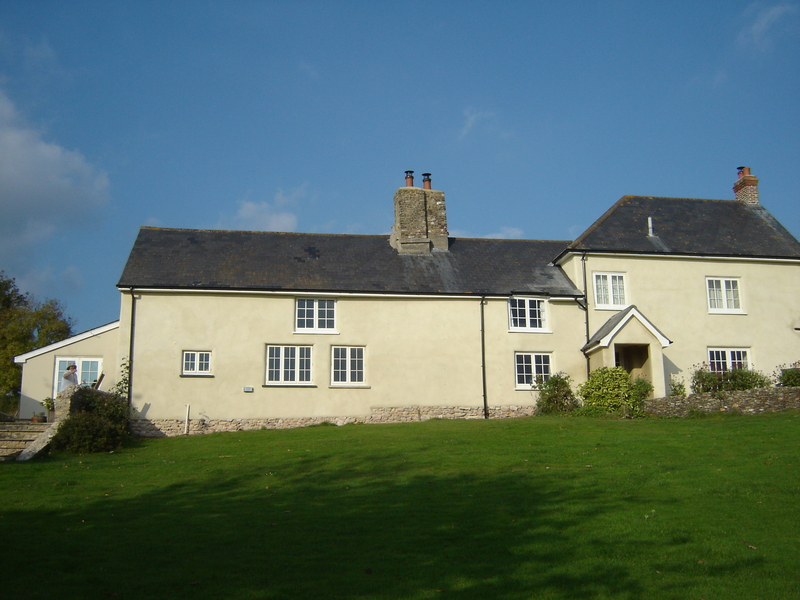 Earthouse partially lime rendered this property. 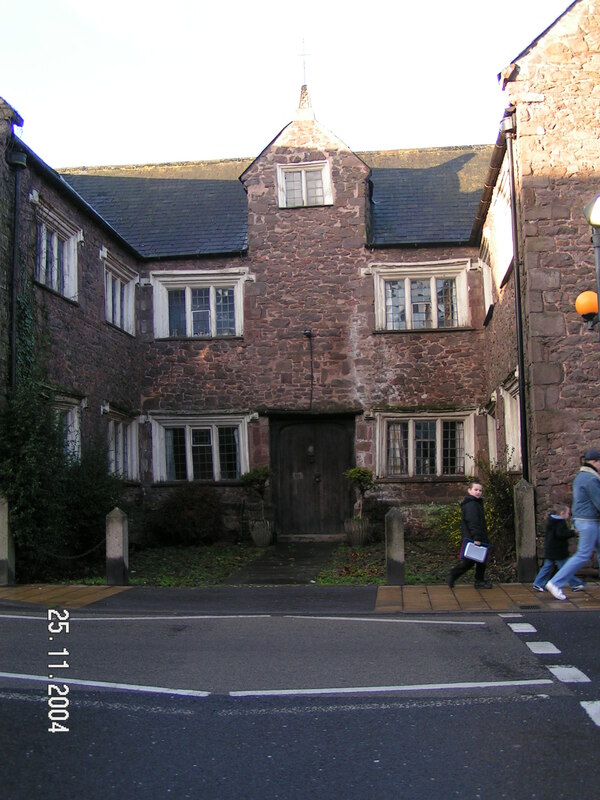 A typical example of a Devon Long House in Westwood. Earthouse did all external restoration work. 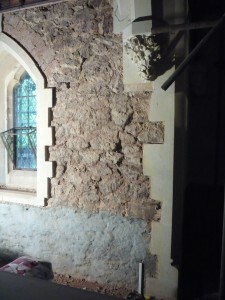 On the right of this picture you can see a partially worked portion of lime render, which we completed later. 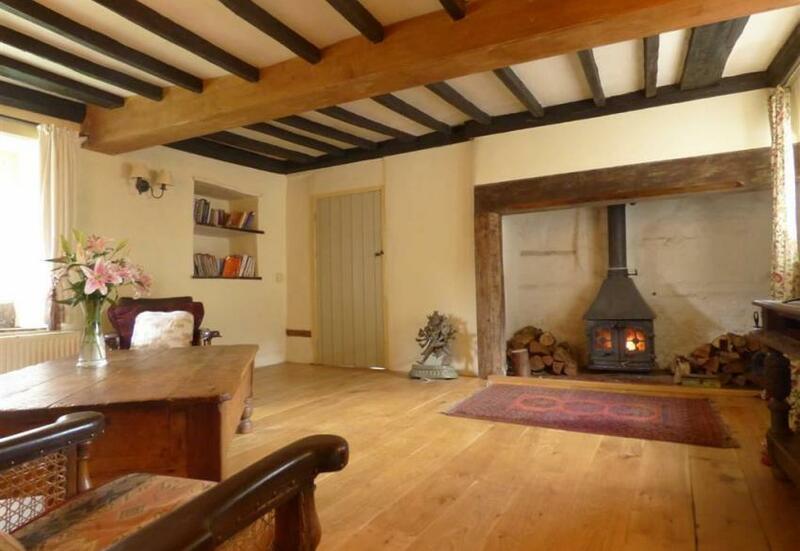 A lovely property near Broadclyst. Earthouse applied a lime render finish and pointed the stone work, leaving it exposed in contrast to the softer lime work. 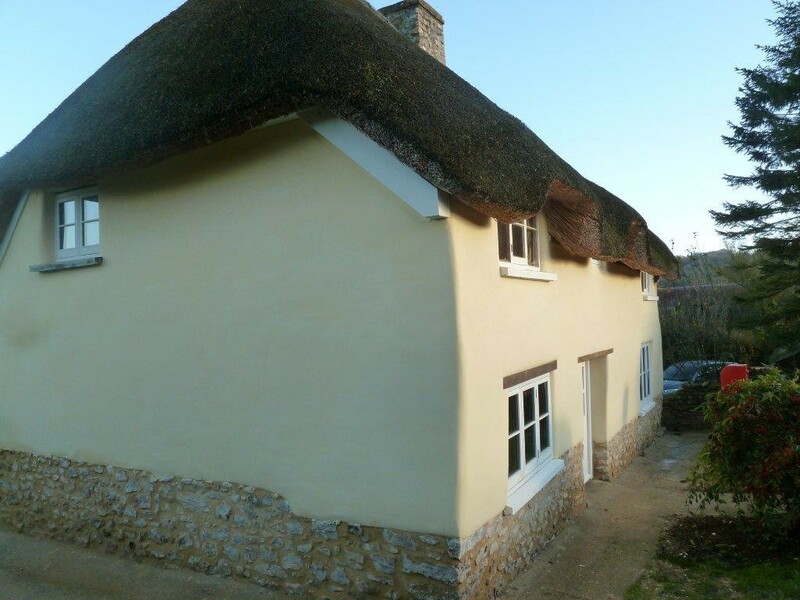 Full renovation and re-rendering of this Devon cottage. This beautiful chocolate box near Honiton needed a full overhaul. The photos below show the works on the property to take it to the newly rendered condition shown above. 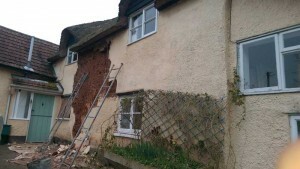 The photos above show the extent of the repair to the side of this cob cottage. 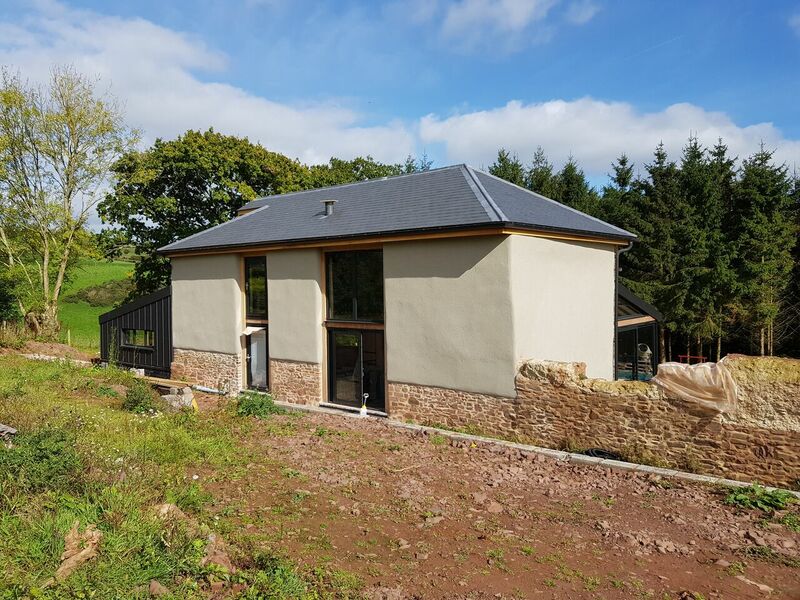 Fully rendered in lime with an exposed stone plinth. This part of the property required extensive cob block and earth mortar repair. This shows another angle, also requiring full repair work to the existing cob, brick and stone work. 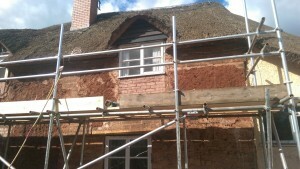 Lime rendered to complete. 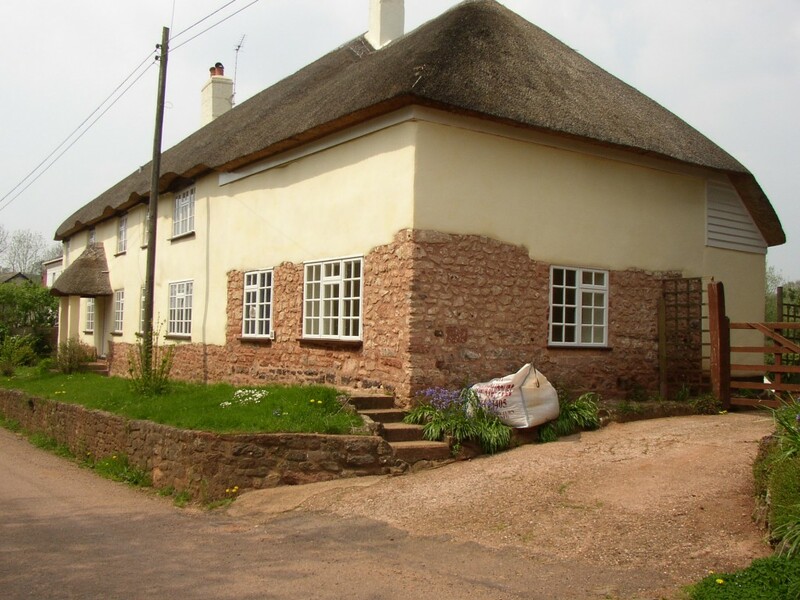 This property is near Honiton; we have worked here for periods over the last five years. Earthouse installed limecrete floors throughout and completed all internal and external lime rendering. 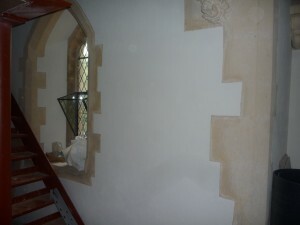 Below are some pictures of the restoration work Earthouse did at Westwood Chapel. This involved stripping off the existing plaster work, and reapplying lime plaster and finally lime washing a stunning white. 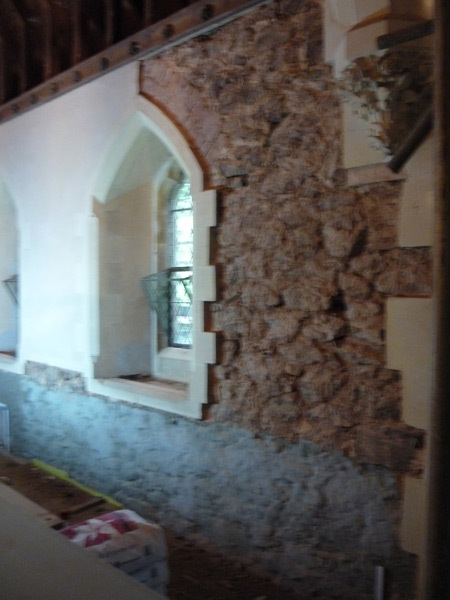 After stripping, following plaster and finally after lime washing. 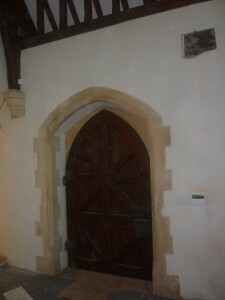 Similar work was undertaken around the chapel door. For more detailed information about what Earthouse do, please browse our website or have a look at our Blogs page. Pinterest – amazing pics that we love! We have recently discovered Pinterest – and we love it! There are so many inspirational ideas on there from all over the world. We have pinned some amazing images that are relevant to us. Tadelakt: we just love this stuff! Amazing images of Tadelakt rooms, bathrooms, pools – beautiful! If you see something on Pinterest that you think we could help you achieve in your property, please share it with us. 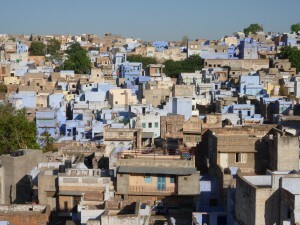 In the meantime, have a look at our pinboards here. If you like any of our photos, you can Pin them by hovering over the image and clicking on the red PinIt! button. Just the formal bit: Pinterest is not formally associated with Earthouse as a brand and in no way sponsors anything we do! 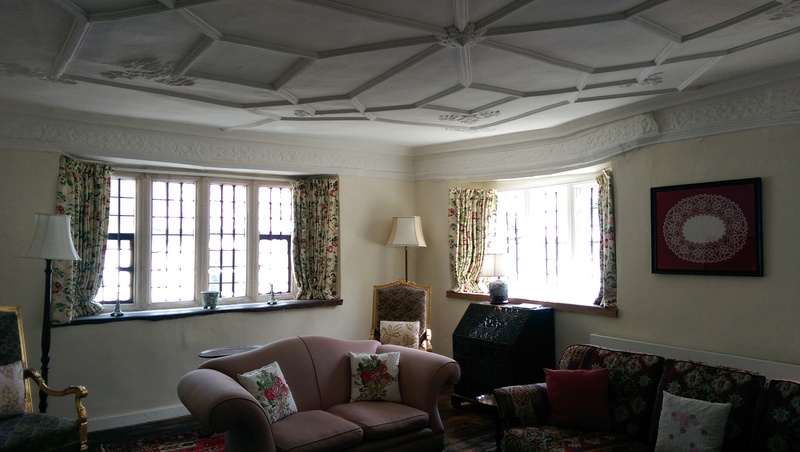 We haven’t used any of the images from Pinterest on our webpage, but here are some of our examples showing creative cob, lime and plasterwork. Photographs below belong to Rowan Pettitt. 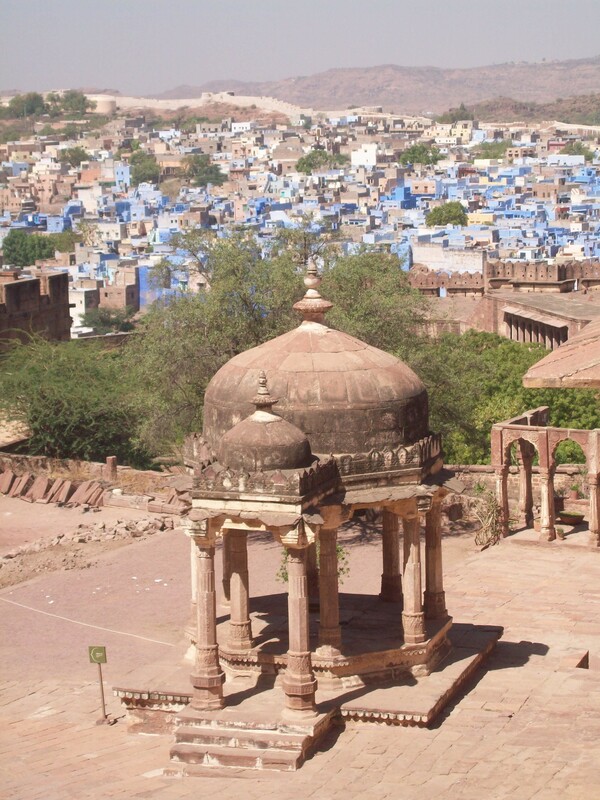 Brilliant blue limewash in Jodhpur, Rajasthan. 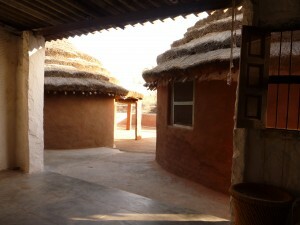 Cob living and working hits in Rajasthani desert. Amazing carpets are spun here! 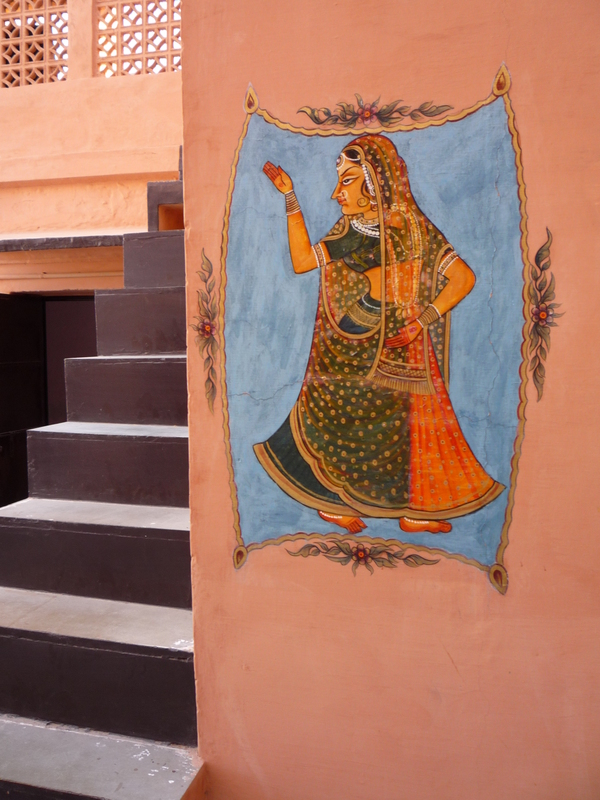 Painting on lime plaster in Udaipur, Rajasthan. 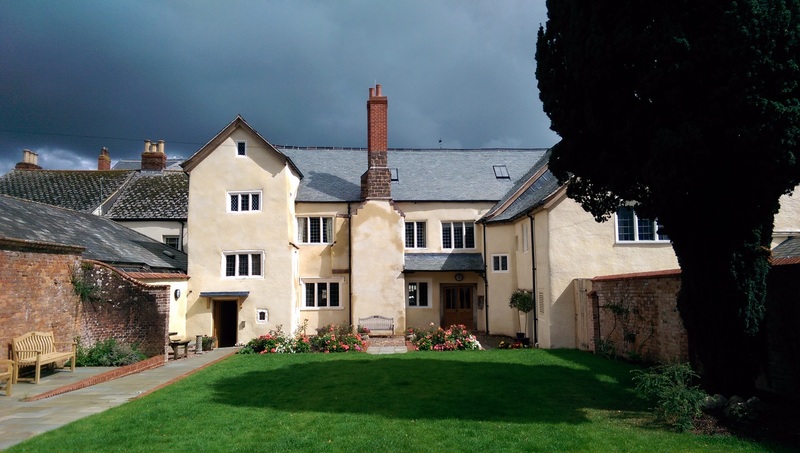 Earthouse Building Conservation Ltd was the only contractor carrying out cob and lime renovations at The Walronds in Cullompton, on behalf of the main contractor Splitlath Building Conservation Ltd. 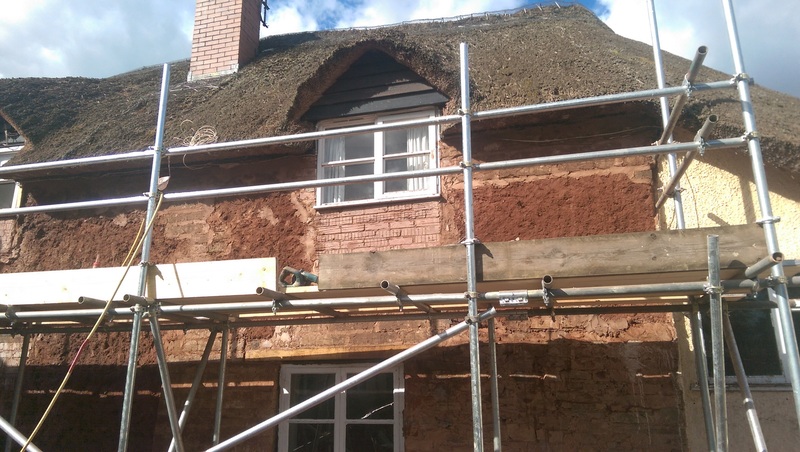 This was a lengthy project backed by English Heritage in order to restore this Grade 1 listed property in the middle of Cullompton High Street. 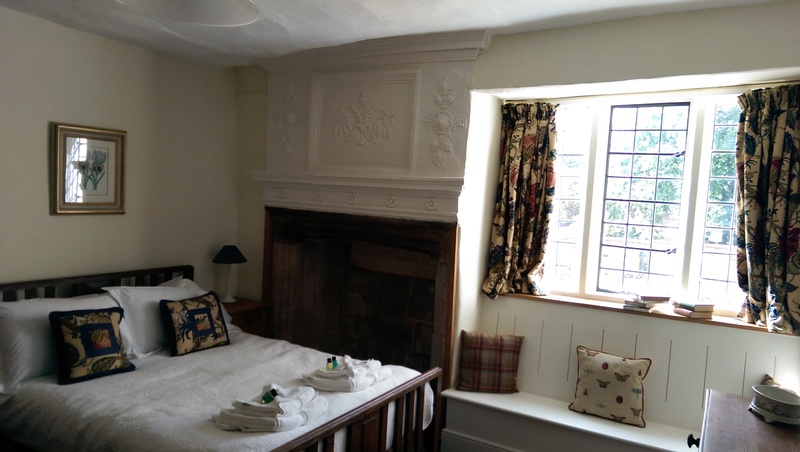 This property was built in the early 1600’s and is of great historical value to the town, so we were very proud to be asked to assist in its restoration. 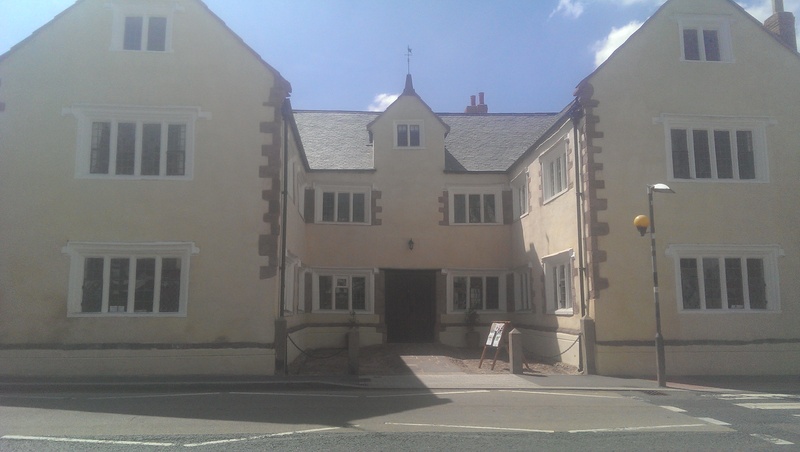 The Walronds is now open to the public with various events taking place. For more information please visit the website by clicking here. 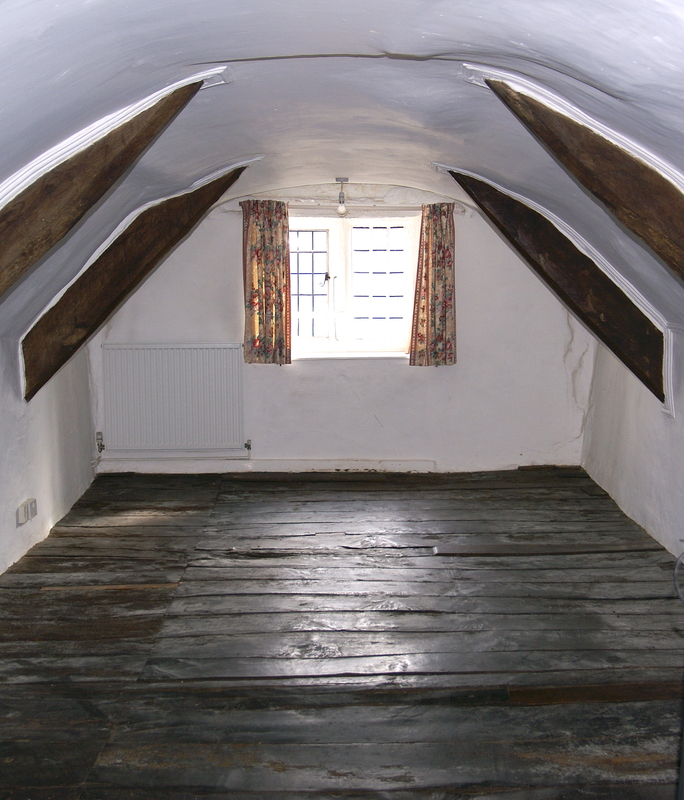 Below you can see some before and after photos. This photo shows the rear aspect of The Walronds prior to work commencing and the same view following the restoration work undertaken. 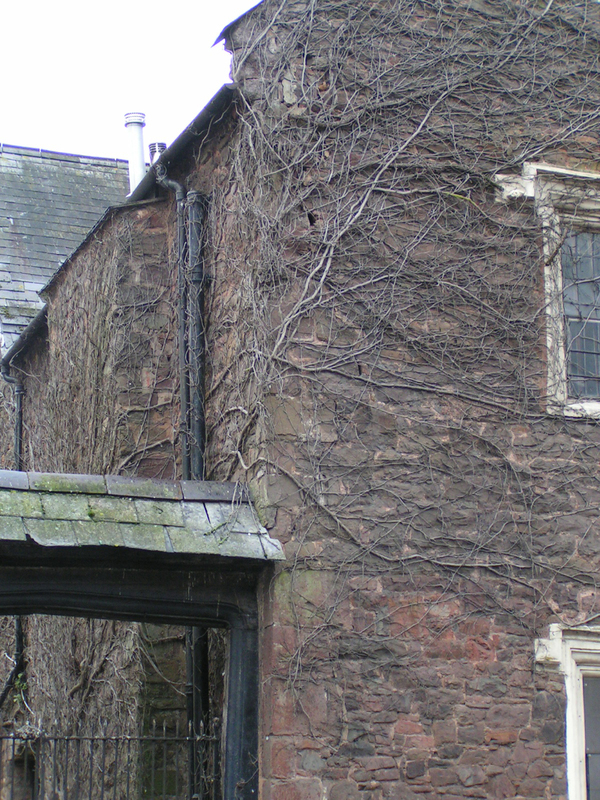 Earthouse carried out conservation and restoration activities both internally and externally, before lime rendering the whole of the exterior and a large percentage of the internal areas. This was the front aspect which looks out into the High Street. Little attention was paid to the building by the general public and many people assumed it was being left to fall into decay. 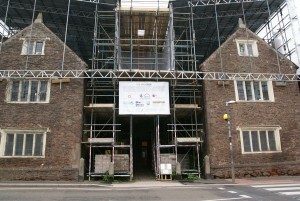 It was shielded from public view whilst work was completed, but most agree that the wait was worth it! It was opened to the public in summer 2014. 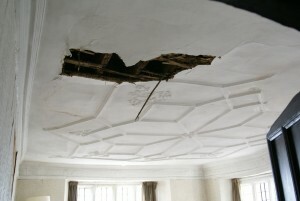 Some of the damage and neglect to the property prior to its’ restoration can be seen below. 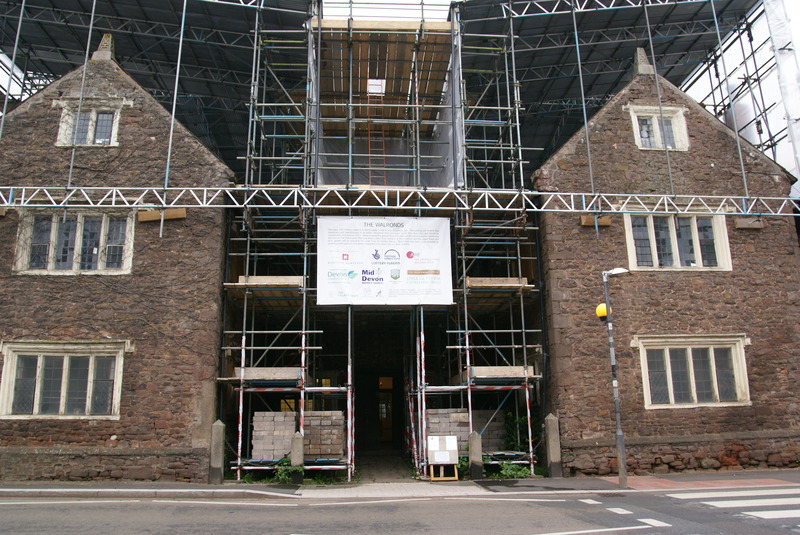 The photos below show some of the before and after photos; there are hundreds of photos that interested parties have taken throughout the project so people well into the future will be able to appreciate the conservation work that took place to restore this beautiful building to its former glory and more! Earthouse assisted with the decorative plasterwork and was responsible for restoring this ceiling. A restored and newly furnished part of the suite of rooms upstairs. Earthouse worked on the lime plasterwork, restoring the laths where required and lime rendering the plaster. 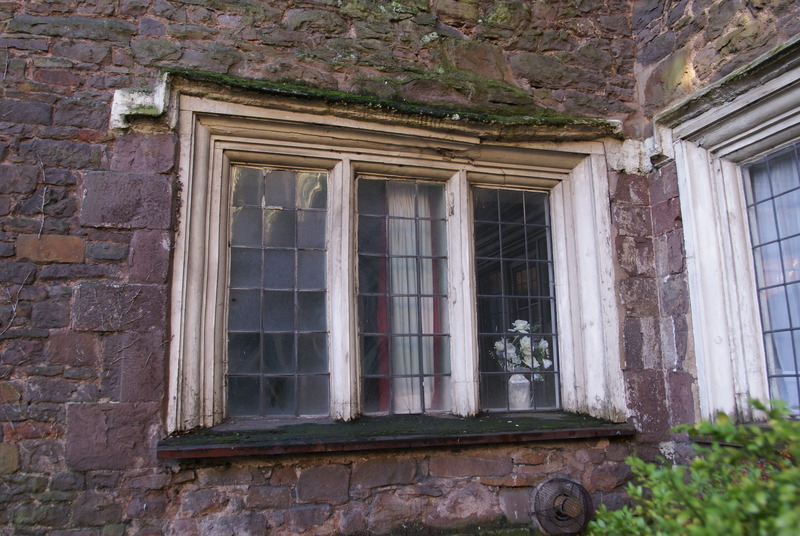 The Walronds has some beautiful old windows, some original. 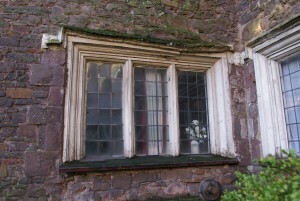 However, the window surrounds were in need of a lot of work. 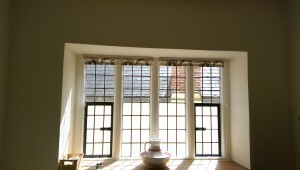 These are some of the finished windows. 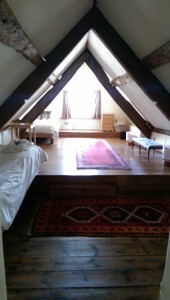 The room above is a bedroom known as The Nuns’ Room. The first picture is prior to restoration. The walls and floor were restored along with the window surround. 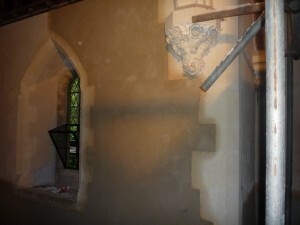 The walls have been lime rendered to create a soft textured finish. Examples of the restored bedrooms. The stairwell was fully stripped and restored. 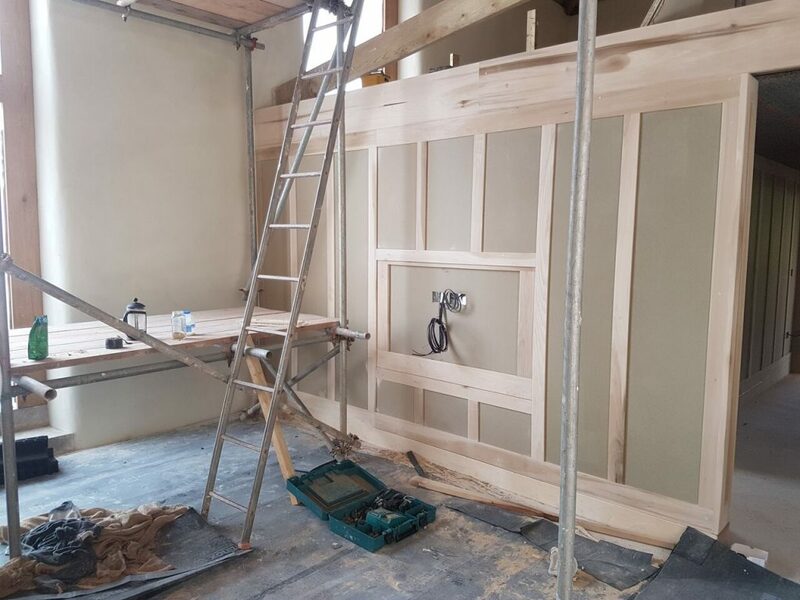 The first phot shows the work part way through, with first coats of lime plasterwork applied and new carpentry in place. The second photo shows the end result. It is great to see that The Walronds is now being used for community and private events regularly. Recently local companies such as The Bakehouse and Pickle Shack have advertised events there, amongst others. Lime is an amazing product; it is breathable so buildings release any damp, it is natural, it is versatile and although it is a traditional material used for thousands of years, it can also look very modern. 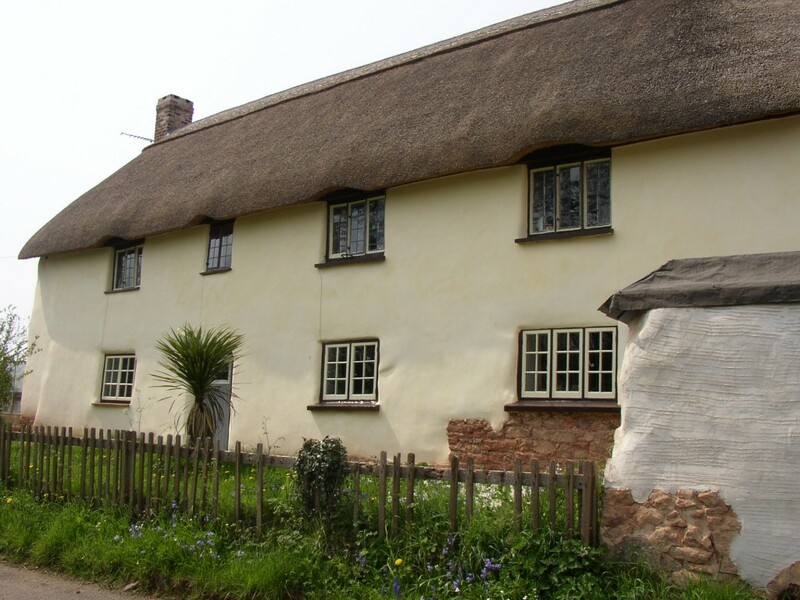 Earthouse can offer a range of lime rendering from hydraulic setting to traditional lime putty render. 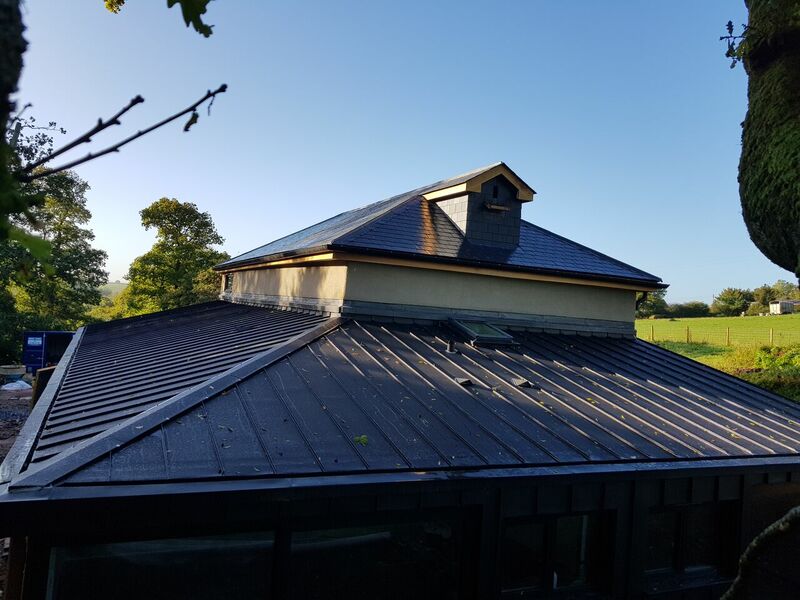 External finishes are designed to be highly textured, which not only creates a tactile effect, but also ensures that the exterior achieves maximum breathability due to the larger surface area. 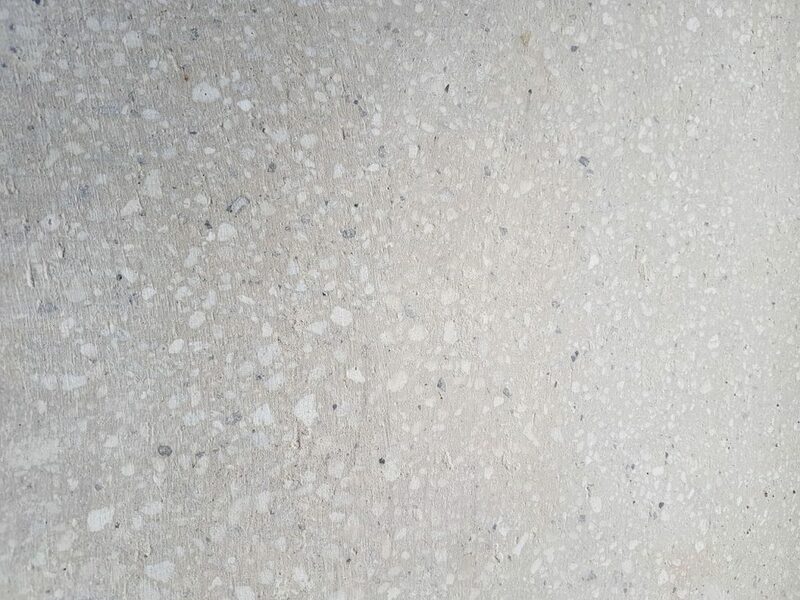 Internally we can create highly polished lime plasters or beautiful textured lime render finishes. 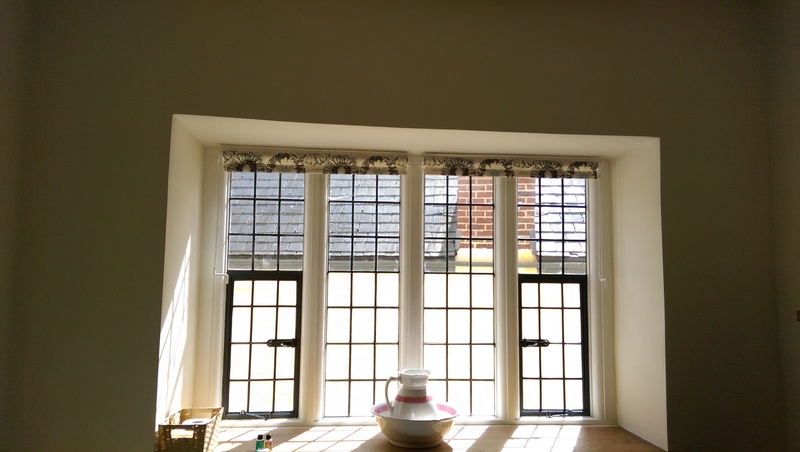 We will always discuss your desired effect and we are able to give advice to ensure the integrity of traditional properties is maintained. Examples of three different effects can be seen in the pictures of our recent projects below. Westwood Church – newly lime rendered, plastered and lime washed.